This is going to be a short post, but I just wanted to throw a couple of photos up of our new chicks that we have at Babci’s house. They are sitting in her living room right now. My whole family was out of commission all week because of a horrendous virus, but luckily I was on the mend by yesterday so I was able to keep my chicken date with a local farmer. This farmer also had ducks, turkeys, geese and some billy goats gruff. Like many local farms around here, you can’t go it alone and almost all the farmers I know have a normal day job in order to sustain their hobby. Come to find out, this one’s husband also works at my company in our IT department. Small world. I was more than happy to help. Even though I applied for my permit over 2 months ago, my hearing is finally in 2 weeks. I jumped the gun a bit but since my immediate neighbors don’t have an issue and the town cashed my >$300 check last week, I figured it was fair game. Worst case, we’ll have a wonderful few weeks with our chicks and then give them back to the farmer we bought them from. I wanted to get the chicks while they were still young and cute. I have no idea what breeds they are. I know there are some bantams for sure, and the larger breeds are a mix of a few kinds of birds. It looked like a very healthy flock at the farm too. I’m really so excited for us all. The permitting process has been pretty thorough. Not only is there an application, but I had two follow up requests for additional information, including a plot plan and all kinds of other random questions about waste management, etc. I knew there was going to be a newspaper ad put in to give people an opportunity to petition against it if desired, but they also sent a letter to the whole street informing my neighbors of the permit application. I don’t see why someone 5 houses down would care or be bothered by chickens but hey, I guess that’s where my $300 is going. The farmer said the biggest pests they have are eagles and hawks, so I’ll have to think about building a little shelter for them to run for cover as needed. I was expecting more of a fox/raccoon problem in my area, so we’ll see what pests these little chooks bring to our neck of the woods. Babci will be out tending them with her water hose at the ready to blast any approaching predators. 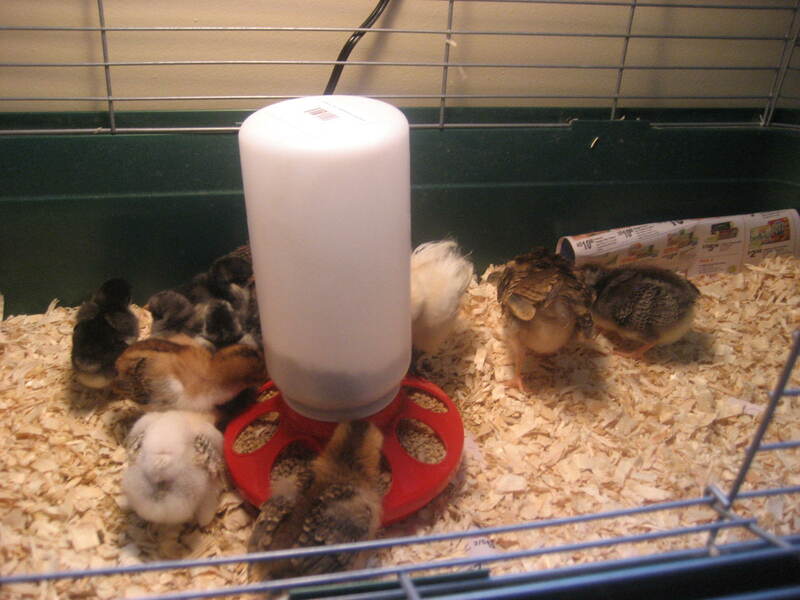 Babci made me buy a heat lamp for the baby chicks and is totally enamored. She’s spoiling them rotten already and I’m so glad. On the healing front, Babci’s leg is turning a little red again, so they put her back on antibiotics, but thankfully her wound is almost fully healed. I think the redness is partly due to a circulation problem, so I just need to be more diligent watching it. I wish there was a way I could help her lose weight as that’s the real issue that’s causing this leg problem. Maybe this incident may help motivate her. I had the doctor prescribe at home physical therapist sessions, which she is reluctant to do, but I think I may force the issue. She lost about 40 pounds when she was doing physical therapy after her knee operations, so that may get her back on the road to recovery. She does like to impress people by her toughness, so having someone push her limits may be good. Okay, that’s all for now. Take care. We have hawk issues but it only seems to be a problem for the first few months. We have a light weight netting that is typically used to keep birds out of fruit trees. It’s low cost and easy to drape up in areas a hawk may drop down. 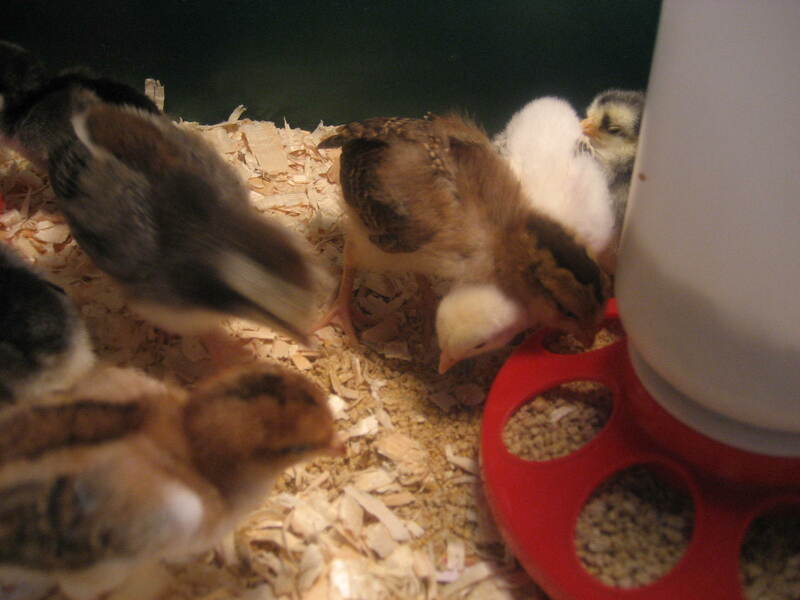 The chicks are so cute and it sounds like Babci is taking charge! Molly – yes, I still haven’t decided how big an area we’re going to have for the chickens and if we’ll fence them completely in. I’m not sure we’ll need it. I’ve seen hawks in my area, too. Many of the resident Chicago chicken keepers are shocked that there are hawks in the city and some of them have lost birds this way. Natural cover always helps, too. If Babci is going to let them out to roam the entire yard at times then they will take cover under shrubs, chairs, tables, etc. My current run set up has too many tight angles for hawks to swoop in, thank goodness, but like Mike and Molly I’ve used that light weight netting in the past, too. If you have bantams be aware that if your run enclosure isn’t covered they may fly out, too. My little bantam roo made it over the fence this morning; it was inevitable since he had already demonstrated to me that he could fly up to the top of the five foot fence, but I was hoping he had enough incentive to stay with the hens and not fly around. I’ll have to let the hens out to roam the yard this afternoon so he can mingle in with them and get back in the main coop; he’s too flighty to catch. At least he’s in the main yard and not the driveway! For bantams I think you’ll need at least a six foot fence around the run. You can try clipping wings but that isn’t always helpful, either. The Speckled Sussex hens still made it up and over the five foot fence with clipped wing when they were a bit lighter/smaller. Thank goodness they seem to have outgrown that tendency! Linda – good point about the tall fence. I did notice the farmer we bought from had a really tall fence, but it wasn’t completely covered, hence asking about predators. She said she built all her coops above the ground so the chickens have a place to run for cover if hawks or eagles happen to be in the area. We have a dozen in there. Wow, you can have that many hens? Portland only allow 3 hens the last time I checked. You’ll have tons of eggs, that’s awesome! It’s nice to hear Babci is healing although not as fast as you’d like. Hope she can lose some weight too. That’s a big problem for older folks.